Week 4 of six weeks studying Galatians! Abba doesn't just mean daddy. It has a sense of ownership built into the word. It's "my daddy" God belongs to us and we belong to him. 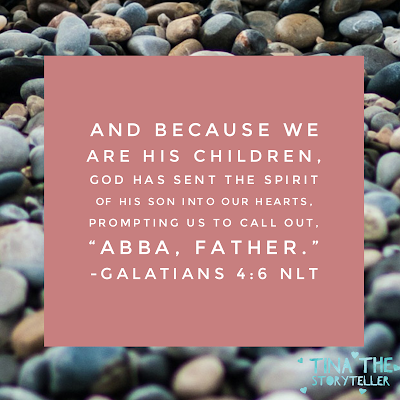 Breathe out "I belong to you"
When Paul showed up in Galatia, he wasn't feeling too well but they didn't let that stop them from hearing the good news he had to share. We can learn something from everyone we encounter if we take the time to do so. Think of one person in your life that is amazing at something you would like to know more about how to do. Contact them and see if they will give you a lesson. Paul says in verse 18 "It is fine to be zealous, provided the purpose is good, and to be so always..."
What are you zealous for? Is it for a good purpose? Have you lost your zeal? Find your zeal this week and act upon it. Read the story of Hagar and Sarah (Genesis 16 & 21). Take a moment and try to imagine yourself as Hagar and then Sarah. Share any insights that you get with the group or in the comments below. Week 4 challenge: Come up with an example in your own life of a law that you used to be a slave to but have now found freedom in Christ. Thank God for that freedom, even if it was won a long time ago or just today. Share your freedom with others. Having trouble getting the podcast to play? You can access it directly through this link. Or send me an email to get a copy of the manuscript.